Social bookmarking is a method for Internet users to share, store, organise, search, and manage web bookmarks. The concept was pioneered by del.icio.us, who coined the term social bookmarking. That was way back in 2003. Since then however, a multitude of alternative services have appeared. Interestingly, the data shows that email is by far the most important way of sharing links, followed by social networking site Facebook. 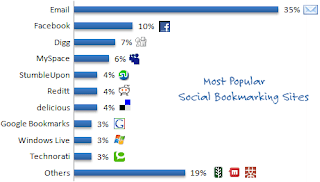 The actual core social bookmarking sites are lagging behing substantially. Unfortunately the data is US centric, but it would be difficult to imagine the European results being too far off.